The earth's temperature slowly and inexorably rises. Global carbon emissions from fossil fuels are expected to reach nine billion tons per year by 2010 and are expected to raise the Earth's temperature by two to six degrees Fahrenheit in the next century. The Earth's temperature in 1998 was the highest ever recorded and exhibited the largest annual increase, setting "a new record by a wide margin," according to NASA scientists. 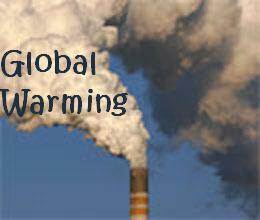 The 15 warmest years on record have occurred since 1980. The highest ever sea temperature in the North Atlantic was recorded in 1995, the same year that twice the normal number of tropical storms occurred. As the planet's temperature rises, it gains a momentum that cannot be stopped, no matter how desperate or repentant we humans may eventually become. The Earth's "fever," like a spinning flywheel, will only subside in its own time. It does not mean, though, that we should just sit back and let the earth follow its cycles. We can at least do something about the poor air quality over our cities due to the use of fossil fuels. World oil use increased by 1.3 percent in 2005, a significant slowdown after a record-breaking rise of 3.4 percent in 2004. The International Energy Agency estimates that oil demand reached 3.8 billion tons in 2005, or 83.3 million barrels a day. "Fossil Fuel Use Continues to Grow"
Some scientists predict that a warmer climate will trigger more violent storms, which will cause increased rates of coastal erosion. 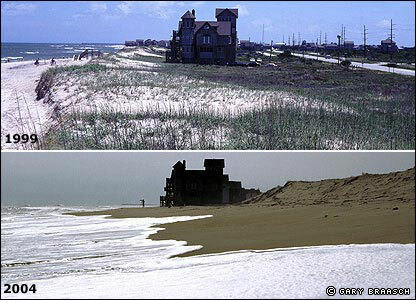 This is a section of shoreline at Cape Hatteras in North Carolina in the USA, pictured in 1999 and 2004. 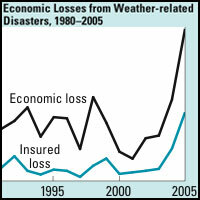 The southern United States and Caribbean region were battered by a series of powerful hurricanes last year. Rising sea levels are also expected to speed up coastal erosion. Other parts of the world could face even more drastic change. The Intergovernmental Panel on Climate Change (IPCC), a consortium of several thousand independent scientists, predicts that sea levels could rise by between 9 and 88cm in the next century. This would threaten low-lying islands such as Tuvalu in the Pacific. 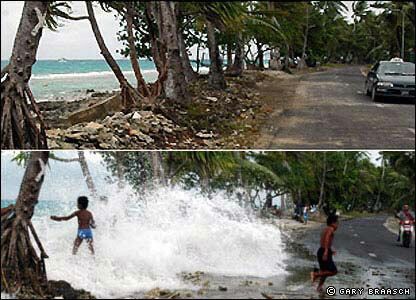 These images, taken on the same day this year, show the effects of a higher than usual tide. Some scientists say an increase in the rate of melting of the world's glaciers is evidence of global warming. Argentina's Upsala Glacier was once the biggest in South America, but it is now disappearing at a rate of 200 metres per year. 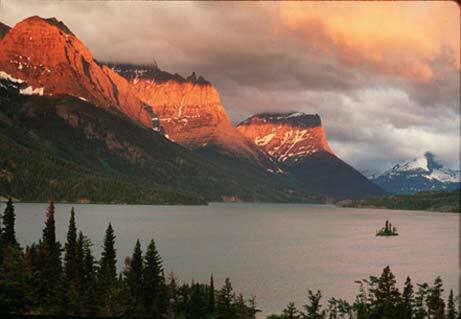 Dawn strikes the mountains rising above St. Marys Lake in Montanas Glacier National Park. When the park was created in 1910, it had 150 glaciers. 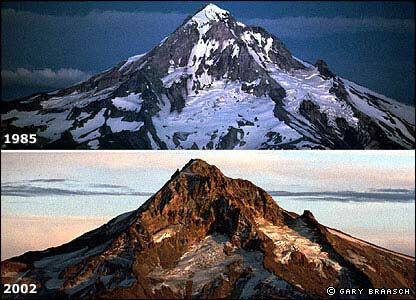 Now it has 30 glaciers, significantly reduced in size. Many of the worlds freshwater glaciers are shrinking, as warming temperatures melt them away. Some have disappeared all together. The glaciers on both Mount Everest and Mount Kilimanjaro are among those glaciers noticeably decreasing as temperatures climb, causing lower-lying towns considerable worry.